There’s little doubt that accounts payable software provides a significant uplift in process efficiency, visibility, and personnel effectiveness. 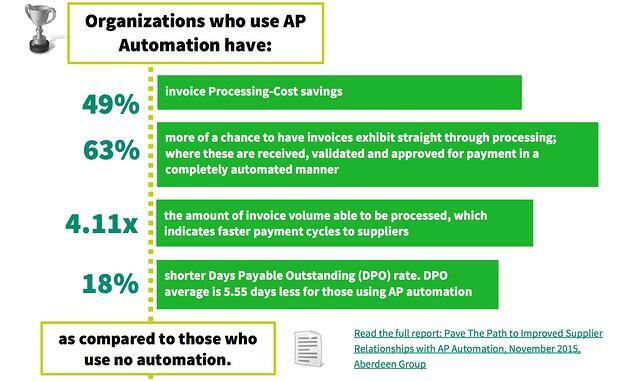 However, the multi-faceted approaches to how invoice processing is executed within the AP department are only a limited means to improving the payment process as a whole. In effect, whatever the approach, whether traditional AP automation or e-invoicing, the idea is that the effort to the front end processing effectively becomes digitized. Once that is executed, AP staff are required to continue the process by triggering payment. The question for many businesses is how does that process happen…? For most it’s a matter of getting critical transactional data into their ERP or accounting system and then following the payment execution processes. Beyond knowing the fact that automation technology improves process and business outcomes, it’s time to look to the future of what’s coming down the pike and for many businesses the telltale signs are becoming clear with each passing day. Essentially the world is just continuing to be one increasingly networked economy that is going to have hooks into many disparate systems to make passing data and handling business transactions reliable and sure. In a nutshell connecting systems and processes is where it’s at. This is evidenced by some of the ground-breaking work that is going on at some of the biggest payment networks the world over. PYMNTS highlights what MasterCard is doing to this end through their strategic API initiatives. For the uninitiated, APIs are defined as application program interfaces and essentially are the sets of routines, protocols, and tools that govern how software components should interact. In a sense it’s a normalized way of exchanging information and it has tremendous implications for the B2B marketplace. Consider that MasterCard and Visa are both making plays for global B2B payments as they both realize that it is an overlooked market that represents a staggering 124 Trillion dollars a year according to the Motley Fool. Further, 50% of those are controlled by ACH which offers some advantages to checks, but certainly not the cash gains of virtual payments. We’d say that someone has finally identified the value of making a conduit (APIs) that is easy for businesses to drive their payments through and there will certainly be numerous companies that follow this lead. Ultimately, payments will shift as CFO’s and Controllers hungry to make positive change and profit for their organizations drive these new technologies forward. Additionally, more suppliers will begin to accept them as they realize the positive impacts of the time value of money...ie. take your virtual payment today or wait a few weeks for ACH or longer for check. Inevitably, more and more companies will accept card payments and enjoy the cash flow derived from the interchange participation and the security advantages that exist over check and ACH. The good news is that you can set your sails to benefit from the winds of change. We advocate that businesses who are looking to improve consider an integrated strategy that encompasses both front end invoice processing through state of the art accounts payable software (ideally cloud-based) and a multi-pronged payments approach encompassing virtual B2B payments, ACH, and for the hold outs, check transactions. If you haven’t taken the time to check out this eBook on what we deem are the Four Keys To Maximizing the Strategic Value of AP then it’s high time you should, especially if you’re looking to structure the best possible payables and payments process!